1978 Honda CB550. This is how she looked when I brought her home. Mostly naked. 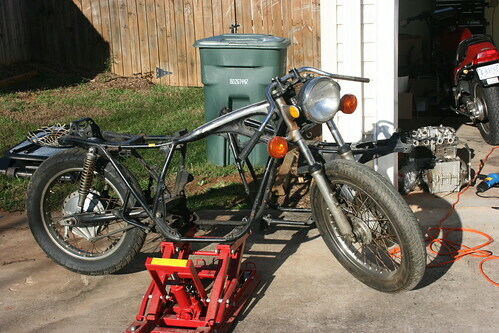 Since this photo, I’ve managed to pull everything off the frame, sand off all the surface rust and re-spray it. I’ve also done a lot of polishing and cleaning to various parts. The winter weather isn’t the best for working in, but we’re halfway through January so it should be getting a bit warmer (I hope). I’ve ordered many parts already and plan on building a cafe racer out of it. More to come as the temperature rises. The frame has been stripped and painted. The wheels have been painted and dressed with new tires. The motor has been cleaned up a bit. 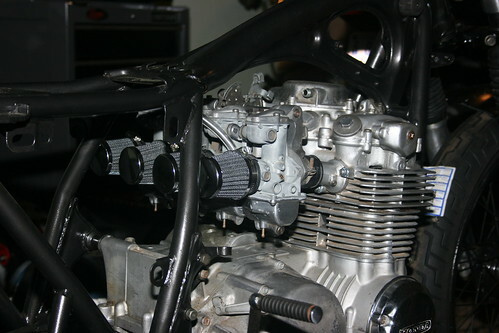 The carburetors have been cleaned and rebuilt.